Wow! It's October already and I'm looking for a pumpkin. 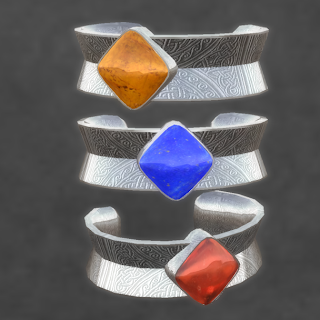 It's also time for new hunts at ELEMENTAL JEWELRY. The Bangles, Bobbles, and Bones Hunt is a Halloween themed hunt--so I've made a unisex bracelet in the colors of the season. It's very resizable, so it will fit guys or gals, and you can wear it on your wrist or upper arm. 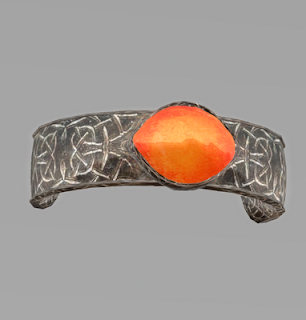 Then, there's another cuff for the Unknown Hunt - One, which also starts on October 1. This hunt is a one year celebration of the first Unknown Hunt which took place a year ago. So, I've taken one of the gifts that I made for that first hunt, updated, improved, and re-textured it, and here you have the new gift for this year! It's a Celtic Silver cuff with texture changing stone in amber, garnet, or lapis lazuli--also resizable. Very nice. And at the Jersey Shore branch of ELEMENTAL JEWELRY, there is the Fright Night Hunt. 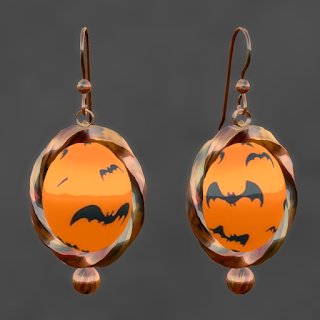 For this seasonal offering, we have a "batty" pair of earrings with little black bats flying round and round. You can't see the motion in the photo, so you'll just have to trust me--they are flying. Also, The Nature's Hunt Miracles of Autumn 2 is still happening, but you'd better hurry on over. It will end on October 16. But, never fear, the Nature's Hunt Haunted Forest 2 begins on October 25--more on that later.